Disclosure: I received free McDonald’s McCafe product coupons to facilitate this review. No further compensation was received. All opinions are 100% my own. Few things are more comforting on a cold winter day than a warm, yummy drink to settle in with and get nice and toasty. I am especially partial to lattes and mochas. One of the greatest perks of being a McCafe Mom is not only do I get the chance to get a sneak peek at many of McDonald’s latest and greatest menu additions, but I get to come back and tell you all about them! For a limited time this holiday season, McCafe has a brand new addition to the menu that is absolutely divine! Have you tried the new McCafe White Chocolate Mocha? YUMMMMM! The new McCafe White Chocolate Mocha is made with a blend of freshly brewed 100% Rainforest Alliance Certified espresso, white chocolate syrup flavoring and your choice of whole or nonfat steamed milk. It is exceptionally delicious topped with cool, creamy whipped cream, but you can feel free to order without to save on fat and calories. 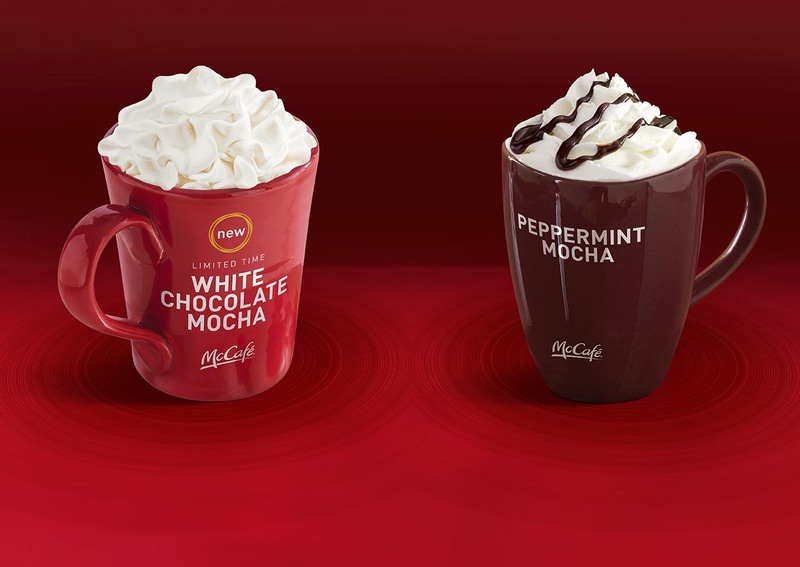 In addition this holiday season, you will want to check out the return of McCafe’s popular Peppermint Mocha. Like the White Chocolate Mocha, this rich and creamy drink is made with espresso made with 100% Arabica beans mixed with steamed whole or nonfat milk, rich chocolate syrup and peppermint flavor and finished off with with a generous spray of whipped cream and chocolate drizzle. I must say, I really enjoyed the McCafe White Chocolate Mocha. I ordered mine with nonfat milk and just a squirt of whipped cream. I will say that it was the perfect balance of milk, chocolate and coffee flavor. It was definitely a bit on the sweet side, making for a yummy sweet afternoon snack. I do love that the McCafe drinks are made to order to suit your personal tastes and preferences. In the future I would likely eliminate the whipped cream in my own drink to save fat and calories but it certainly was the perfect addition to this rich and delectable drink. Simply leave me a comment below telling me which McCafe Hot Beverage you are most excited to try. Be sure to leave your email address in your comment so that I can contact you if you are chosen as my winner! Winner will be randomly selected on 1/09/14 and notified via email. Good Luck! The White Chocolate Mocha sounds tasty! mindy_delisi@hotmail.com I follow you on Facebook also! Mindy, be sure to leave your Facebook follow as an additional comment so it counts as a second entry! I can’t wait for the White Chocolate Mocha! Jeanine recently posted…New American Girl Isabelle Items Available for Pre-Order! The white chocolate mocha looks good! I think that white chocolate mocha sounds yummy! The White Chocolate Mocha sounds really good. Also, I follow you on FB! I would like to try white chocolate mocha. The White Chocolate Mocha would hit the spot right about now! White chocolate mocha sounds yummy! I followed you and @McPhillyD and tweeted under @kimreadthis on 1/3/2014 at 1:20pm. McCafé Caramel Mocha would be my choice! I’d like to try the White Chocolate mocha! I would try the peppermint mocha. I follow you on facebook too!! Id love to try the Peppermint Mocha! Sounds yummy and perfect for this time of year! I too live mochas and lattes. 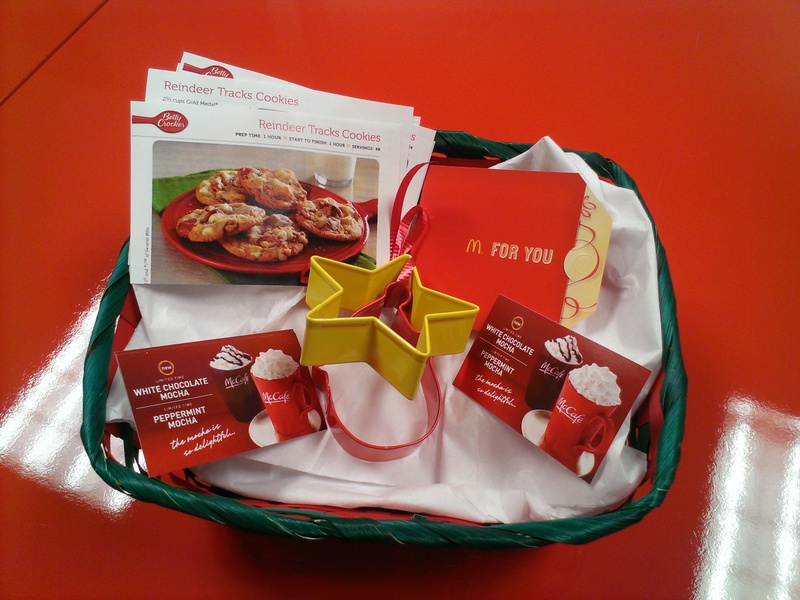 I am excited to try both flavor sand have a chance to win the mc Donald’s gift basket. My email is Cole424@verizon.net. Thanks! I can’t wait to try the white chocolate mocha! I’d love to try to the white chocolate mocha! I tried the white chocolate mocha. It was delicious. I am excited to try the peppermint one also. YUM! I have completed all twitter parts. I think I would like to try the white chocolate mocha .